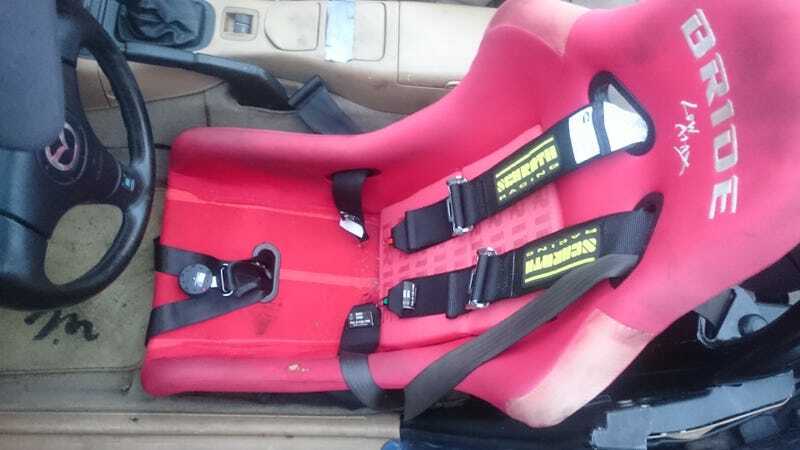 I have successfully installed a Schroth 6 point harness into my Miata! Adjusting the belts and stuff is kinda difficult but I got it mostly right and the test drive felt quite good. Then the stock seat belt still works just fine so the drive to work the next day was normal without using the harness. Was very excited to get this box yesterday. Drilling the floor mounts and finding places for the lap belts to mount was relatively easy, just took some time to figure out. The eye bolt threaded right in for the drivers side mount so it easily holds both belts there. The trans tunnel side had a nice hole for the O2 sensor wire and the floor holes were simply drilled as close as possible to the frame rail and roughly under the seat. Could have gotten away with shorter bolts but these will do, nice and secure. Damn exhaust in the way, had to use a box wrench to tighten this one all the way down. I need more ratcheting wrenches! The shoulder belts I currently just wrapped around the roll bar but I am trying to find a better way to do this. May have to get a harness bar welded in or somehow find a bolt in one (Boss Frog is out of production, so I can only get them second hand). This is my biggest headache with my setup. Boss Frog says I can do it around the roll bar but did not describe exactly how to do it safely. Schroth instructions say shoulder harness cannot be twisted so I may be SOL without a horizontal bar. Maybe I can wrap both around the bottom support? Overall a much easier project than I thought it would be. Took a total of like 3 hours with following no instructions of any sort and just kind of winging it. It feels amazing being latched in nice and tight. And as long as I adjust the mirrors correctly, it does not negatively impact seeing out of the car and driving around. I can still reach the radio and everything I normally could while driving. Excited to test it out at a track day eventually but at least I will have an Autocross at Pocono on Saturday as a first real world test. Yes I know left and right shoulder belts are mixed up, I will fix that lol.